Debuting at a unique fashion film event in London earlier this week, Alex Mattsson's film for his A/W'11 collection was one of those specially selected amongst others like J.W.Anderson, Henry Holland, Fred Butler, and Piers Atkinson. The Swedish-born designer's latest collection of innovative menswear designs entitled 'Gliptolithic Man', were inspired by ancient artifacts in Peru and the links between man and extraterrestrial life. Dazed Digital: Where are you based/Where are you from? Alex Mattsson: I was born in Gothenburg Sweden, 1984. Grew up in Oslo Norway and moved to the UK in 2004 to study Fashion Design at UCA Rochester. After graduating from UCA 2007 I went straight on to an MA in Menswear at The Royal College of Art. About five months ago I moved in to my current studio in Bow, East London. DD: Why/when did you first become interested in fashion? Alex Mattsson: I started reading fashion magazines like The Face, i-D and Dazed & Confused when I was 15-16 and living in Oslo. I found it really exciting to read about the London fashion scene and it eventually inspired my to move to England and pursue a degree in fashion. DD: Can you tell us about your latest collection? What was your main inspiration? He was heavily criticised for his theories as there is at least 60 million years between human and dinosaur existence. I have always found fantastical and elaborate myths really interesting and exciting. Especially when they are rooted in real ancient artifacts or texts. 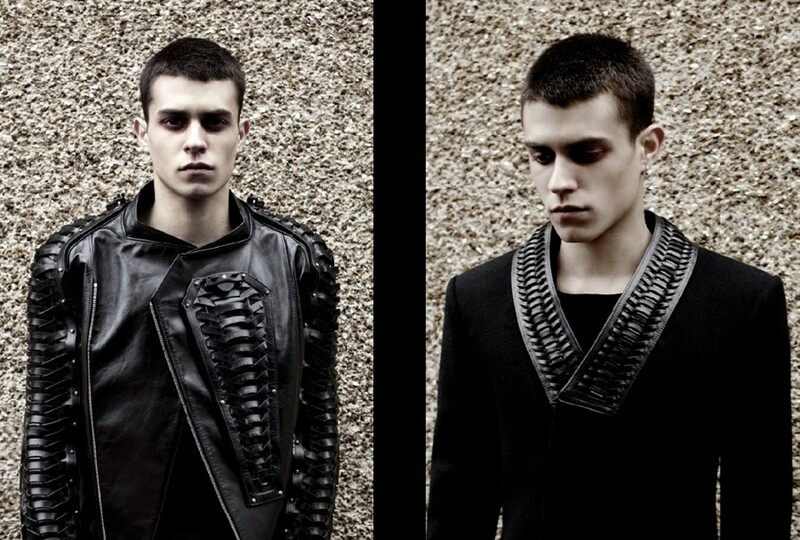 My A/W'11 collection 'Gliptolith' is my vision of Dr. Cabrera's extraterrestrial super-humans. Alex Mattsson: I suppose some of the difficulties are as old as the profession it self and many are a product of the current economic situation. Fashion is a privilege that gets hit hard every time the economy struggles. As a ‘credit crunch graduate’ it can be really hard to set up and run a business that deals in luxury fashion. Alex Mattsson: The plan is to evolve my work and label. Beyond these things I don’t really have plans as such. Doing some collaborations would be fun! DD: Who is your favourite designer and why? Alex Mattsson: I don't really have favorite designer anymore. It varies from collection to collection. For AW11 I really liked Givenchy’s collection by Riccardo Tisci and the Junya Watanabe’s womenswear. DD: Where can we buy your work? Alex Mattsson: As this is the first collection I am intending to sell so I will probably find out within the next month, but it looks like Tokyo, Japan is a definite. Stockists will be up on the website as soon as they are confirmed.